Welcome back to You Should Be Watching, the home of lost and forgotten movies and TV shows. This week, we’re blazing a trail through Central America to find the City of Gold with Kenneth Branagh and Kevin Kline in DreamWorks’ The Road to El Dorado. The film was a bona fide box office bomb at the time, and despite generating a few semi-popular memes, I still rarely hear anything about it. Critical reception upon release was not very good, and if the movie came out now, I believe it would be even worse. We’ll come back to that. Let’s take a look. The year is 1519 and Cortez is headed for Cuba in search of gold. After cheating at gambling and making off with a map to El Dorado, the City of Gold, con men Miguel (Kenneth Branagh) and Tulio (Kevin Kline) unwittingly cross paths with Cortez, and he takes them as prisoners. They escape, steal his longboat and one of his horses, and manage to make it to shore. Using their map, they make it to the city, are mistaken for two long-awaited gods, and might just find more than gold. The Road to El Dorado was released in the early days of DreamWorks Animation when their films were somewhat experimental and not all CGI. The story is akin to Rudyard Kipling’s The Man Who Would be King, the humor isn’t very child-friendly, the characters are off-the-wall, and the visuals range from conventional to trippy and everything in-between. Honestly, I’m not surprised it wasn’t a big hit at the time of release, but I do find it interesting that it hasn’t developed more of a fringe following like Disney films such as The Black Cauldron and Hercules. The Road to El Dorado has a defined story, and the principal characters have understandable motivations, but this is a somewhat unconventional recommendation for me because this film is really to be watched for the technical aspects. Most of the time I admire films because I find the characters likable and the story engaging, and I consider things like visuals, music, and comedy to be secondary concerns. In this case, the characters are likable but not lovable, the story serviceable, and some of the aforementioned aesthetics outstanding. Even in their worst movies, one thing I can usually (I say “usually” because Antz and Shark Tale exist) appreciate about DreamWorks is their style. Disney definitely has outliers like Sleeping Beauty and Hercules, but overall there is a certain aesthetic we tend to associate with them. Lots of soft, round faces and big eyes, colorful but usually conventional backgrounds, and certain colors attributed to certain types of characters. This isn’t a bad thing, and I think it’s just part of the studio’s identity, but character designs from DreamWorks vary more widely and more often, and seem more interested in bringing out character than being conventionally attractive. The same could be said for Pixar. The Road to El Dorado is a shining example of this; the characters’ looks are a perfect mixture of realism and Warner Bros.-esque exaggeration. They serve the zany, trippy sequences and genuine confrontations equally well. The same applies to buildings, animals, and backgrounds; there are shots in this film that are interesting and detailed enough to be sold as fine art prints. Then, there are also designs that’ll make you question whether the animators were on drugs, and I mean that in a good way. The use of color in this movie is insanely imaginative, and the integration of Latin-American art adds to this film’s unique look. The Road to El Dorado has one of my favorite soundtracks in any movie ever. The original score was written by John Powell and Hans Zimmer, and while they’re two of my favorites and either one could have worked wonders, what they create together is amazing. This is one of those films where I can remember random tracks from throughout the score, and even get them stuck in my head without having seen the movie in months or even years. The original songs by Elton John and Tim Rice are also fantastic. My favorites are “Without Question” and “Someday Out of the Blue” (which plays during the film’s end credits). “Without Question” and the sequence during which it plays give Miguel a chance to be himself and really get to explore El Dorado and know its people. 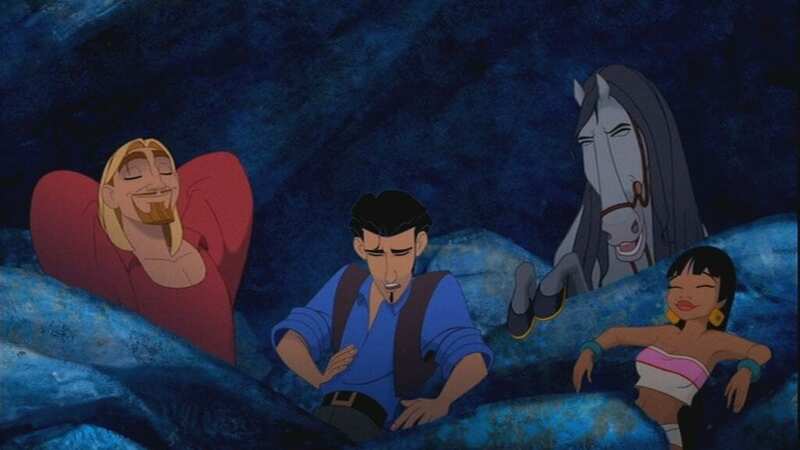 This is the first time in the movie where he’s been without Tulio, and he’s at his most free here; his desire for gold and pulling scams melts away, and he learns something about himself, as well as this place and his new friends. “Someday Out of the Blue” doesn’t really connect with the film’s plot or characters that well; in fact, I’m not quite sure why they chose to include it. However, it’s a beautiful song with a lovely melody and a soaring vocal performance by John. “It’s Tough to be a God” is the only song in the film that the characters themselves perform, and it’s a lot of fun. This is also one of the most visually interesting sequences in the whole movie, and that’s saying a lot. Even the cut songs such as “16th Century Man” and “The Panic in Me” are catchy, memorable, unique, and worth a listen or 25. Much like the score, I remembered these songs even after years without seeing the film, and I believe they grow on you over time. While The Lion King has the better musical score, The Road to El Dorado has better songs and, overall, a more cohesive soundtrack that serves as a work of art and a statement even outside of the context of the film. Mic dropped. The voice acting in The Road to El Dorado is really something else. Kevin Kline plays cynical con man Tulio, and he’s extremely funny. Between this and The Hunchback of Notre Dame, I wish Kline would do more voice work because he’s got a versatile voice and he really puts his heart into it. His optimistic compadre Miguel is voiced by Kenneth Branagh, who is, of course, great, as he always is. The rapport between the two is yet another thing that makes the film stand out; at the time, The Road to El Dorado was unique in that the two lead actors recorded their lines together so that they could play off one another’s performances. Rosie Perez is funny as Chel, their “man on the inside” and Tulio’s eventual girlfriend. Armand Assante and Edward James Olmos are terrific (and frankly under-appreciated) as Tzekel-Kan and Tannabok, El Dorado’s high priest and chief, respectively, who could not be more different. There are a couple of things in The Road to El Dorado that preclude it from reaching true greatness: there is a casual racism to it, a la Disney’s Pocahontas, and we never really connect with the characters on a personal level. This film’s plot is much more inventive than, say, that of How to Train Your Dragon, but while that film had such strong characters and relationships that it avoided being a stereotypical trope-fest, this film… doesn’t. The characters are enjoyable here, and you can understand them, but you don’t really learn anything from their journey, and there are no deeper themes at play here. That being said, I think the good outweighs the bad, or else I wouldn’t be recommending it to you. This movie is barrels of fun. Overall, I think The Road to El Dorado is very underrated. A lack of political correctness probably led to its demise at the box office and with critics, and the presence of bad words and sexual content makes it unsuitable for very young children. But if you can see past those things, there’s a lot to love here. This film has a look and sound to it unlike any other, as well as the passion of actors and animators who poured their hearts into this project. 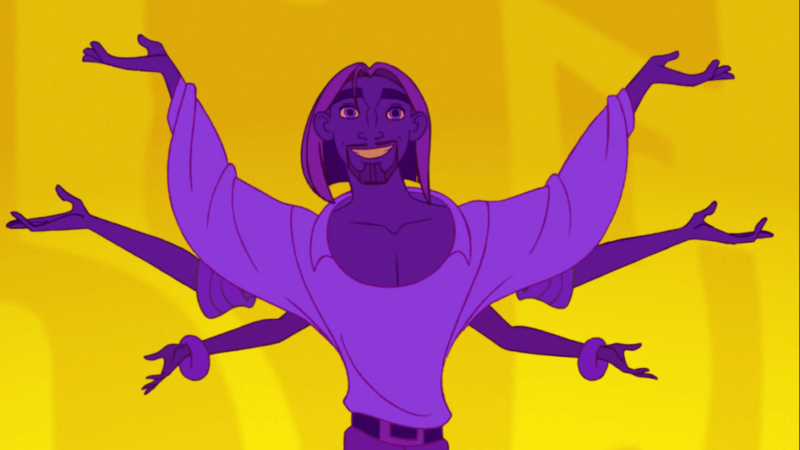 The animation, music, and performances are why you should be watching The Road to El Dorado. The Road to El Dorado can be found on DVD pretty much anywhere, and usually for pretty cheap.